High reliability, high accuracy, robust design and approvals have always been important when INOR is developing new products. It´s now time to introduce a new member in the family – the IPAQ 330. The IPAQ 330 is developed for excellent life cycle performance and is our next step in the new transmitter platform. Simulated output, runtime-counter, Callendar-Van Dusen coefficients are some of the new features in this temperature transmitter. IPAQ 330 is a modern, isolated, universal temperature transmitter developed to meet the highest requirements on flexibility, accuracy and reliability. A temperature transmitter compatible with both Pt100-sensors and thermocouples offers high flexibility and reduces the number of installed product variants. 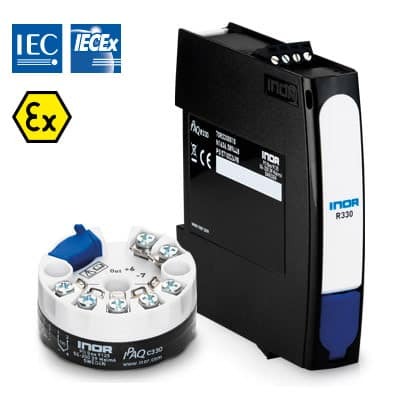 IPAQ 330 is available with ATEX and IECEx certificates, making it a safe choice for a wide range of applications. IPAQ 330 has the highest level of measuring accuracy with only +/- 0,08% of temperature span. With a maximum drift of ± 0.1°C or ±0.1% of span over 5 years makes regular calibration less necessary. IPAQ 330 is a highly reliable and robust temperature transmitter. External influences such as ambient temperature, vibrations up to 10 g, moisture and electro magnetic waves have minimal influence on the measurement result. IPAQ 330 is optimized for cost efficiency over its life cycle, from storage and configuration, to installation and commissioning. The universal input of IPAQ 330 enables simple, on-demand configuration and sensor selection and thereby reduces the number of product variants on stock. The IPAQ 330 is available in both head-mounted and a rail-mounted versions.